Giant cell carcinoma of the lung (GCCL) is a histological type of nonsmall cell lung cancer and now classified as one of the five subtypes of sarcomatoid carcinoma of the lung. GCCL is characterized by the presence of pleomorphic multinucleated giant cells. The reported incidence of pure GCCL is 0.1-0.4% of all lung cancers. A 50-year-old male patient, presented with the complaint of pain in back radiating to right lower limb and chest pain for 3 months. Chest radiograph and computed tomography (CT) scan showed a large mass in right parahilar region. Magnetic resonance imaging spine was suggestive of compressive myelopathy at L1 vertebra. CT scan guided aspiration cytology was advised from L1 vertebra and bronchoscopic fine needle aspiration cytology (FNAC) from right parahilar mass. 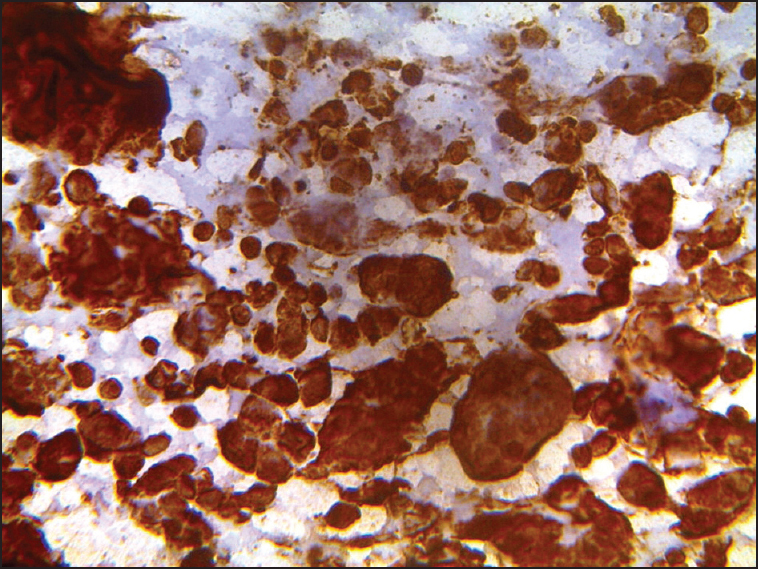 Aspirated material was smeared on glass slides, and few were immediately fixed in 95% alcohol. Slides were sent for cytopathological examination and stained with Giemsa and Papanicolaou stain. On microscopic examination, FNAC smears from both the sites showed numerous multinucleated and mononuclear giant cells in a background of necrosis and inflammation comprising of lymphocytes and neutrophils [Figure 1]. The giant cells were pleomorphic, coarse nuclear chromatin with moderate to abundant cytoplasm. Occasional atypical mitotic figures along with few bizarre cells were also evident. 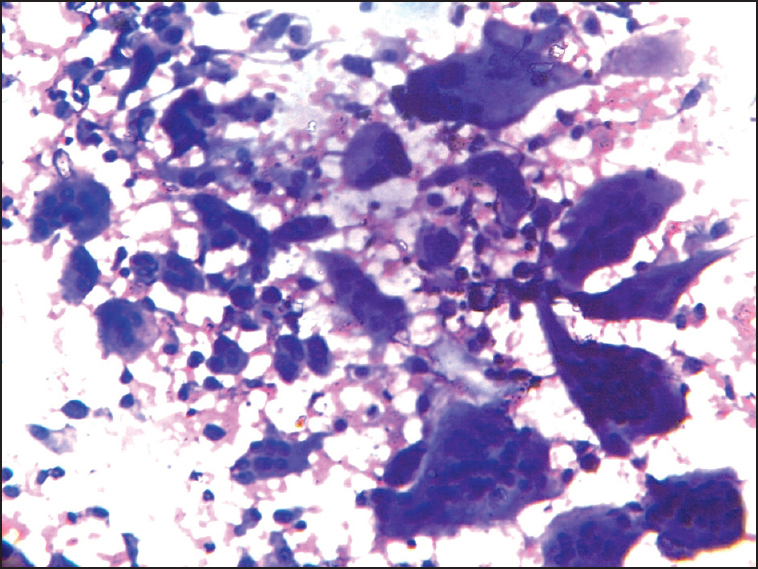 Figure 1: Fine needle aspiration cytology from right parahilar mass and L1 vertebra showed numerous multinucleated and mononuclear giant cells in a background of necrosis and inflammation (Giemsa stain, ×200). Cytological diagnosis was vertebral metastases from GCCL. For further confirmation on immunocytochemistry, Vimentin [Figure 2], Cytokeratin, and thyroid transcription factor-1 were positive, and CD68 were negative. The final diagnosis of vertebral metastases from GCCL was made. Giant cell carcinoma of lung, a rare histological type of NSCLC, was first described by Nash and Stout in 1956. The characteristic giant cells in GCCL have been described as pleomorphic and anaplastic with mononuclear and multinuclear forms. The therapeutic strategies adopted for GCCL are the same as for patient with other variants of NSCLC. However the prognosis for the former is worse. , GCCL has been regarded as an aggressive cancer with more than half of the cases presenting with metastatic disease and median survival in the range of 8-10 months. However, a few case series has shown a better prognosis with surgical resection of early stage disease. We report this case because of its rarity. Recognition of GCCL may be possible with adequate cytological material and the reliable diagnostic criteria of this malignancy. Nash AD, Stout AP. Giant cell carcinoma of the lung; report of 5 cases. Cancer 1958;11:369-76. Alasio TM, Sun W, Yang GC. Giant cell carcinoma of the lung impact of diagnosis and review of cytological features. Diagn Cytopathol 2007;35:555-9. Yuki T, Sakuma T, Ohbayashi C, Yoshimura M, Tsubota N, Okita Y, et al. Pleomorphic carcinoma of the lung: A surgical outcome. J Thorac Cardiovasc Surg 2007;134:399-404. Raveglia F, Mezzetti M, Panigalli T, Furia S, Giuliani L, Conforti S, et al. Personal experience in surgical management of pulmonary pleomorphic carcinoma. Ann Thorac Surg 2004;78:1742-7. Mochizuki T, Ishii G, Nagai K, Yoshida J, Nishimura M, Mizuno T, et al. Pleomorphic carcinoma of the lung: Clinicopathologic characteristics of 70 cases. Am J Surg Pathol 2008;32:1727-35.